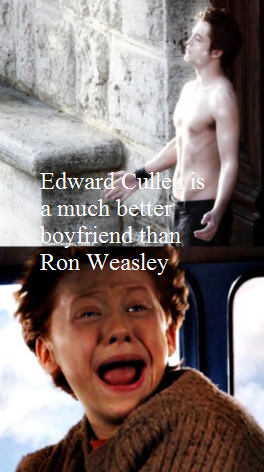 Edward Cullen is a better boyfriend. spoof confession. Wallpaper and background images in the Harry Potter Vs. Twilight club tagged: twilight harry potter ron weasley edward cullen boyfrined spoof confession. This Harry Potter Vs. Twilight fan art contains street, city scene, and urban setting. There might also be sign, poster, text, and chalkboard.